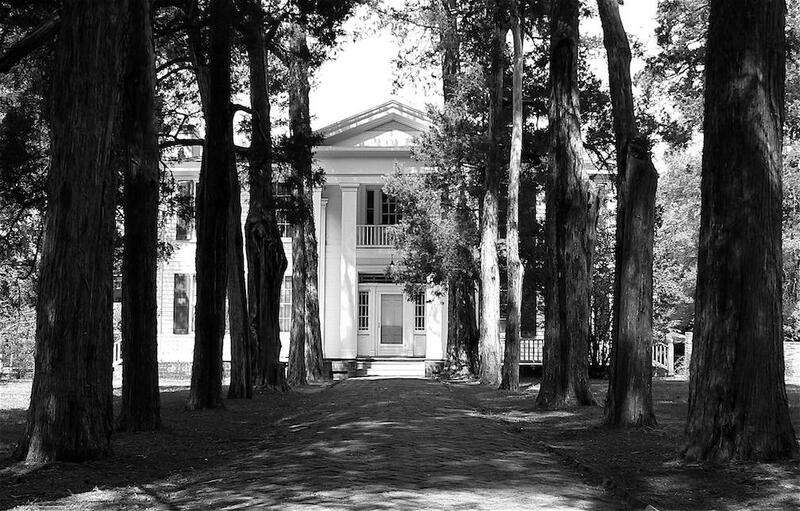 Rowan Oak is the Oxford, Mississippi, home where William Faulkner lived from 1930 until his death in 1962. Today it is a house museum for visitors interested in Faulkner’s life. The property that eventually became Rowan Oak was a US land patent given to a Choctaw, E-Ah-Nah-Yea, in 1832. E-Ah-Nah-Yea deeded the property to a land company in 1836, and Robert Sheegog bought it in December 1844. Sheegog built the house, and his family lived there until 1872, when John M. Bailey purchased it and the grounds. Members of the Bailey family resided there until 1923. Faulkner bought what was known as the Bailey Place in 1930 and renamed it Rowan Oak the following year. The University of Mississippi rented the house from his widow, Estelle Faulkner, after his death. When she died in 1972, the university purchased the house from Jill Faulkner Summers, William and Estelle’s daughter. Sheegog built three buildings still standing at Rowan Oak: the post oak barn, a detached kitchen, and the main house. He also built servants’ quarters, which were in ruin by 1910. Evidence suggests that the post oak barn served as a living structure from 1844 until 1848, when the Sheegog family first occupied the main house. The post oak barn originally had two floors, but only the ground floor remains today, with two main stable areas, a corn crib, and a hay loft. The detached kitchen, which consists of two rooms with a central chimney, remained in daily use until 1910, when an indoor kitchen was added to the main house. The main house is a two-story clapboard house in a modified primitive Greek Revival design, with four Doric columns that support the pediment above the porch. Plans for the house were made by William Turner of Oxford. It was originally L-shaped, with a central entryway flanked on the east by two rooms with two rooms above and on the west by one room with one room above. Above the entryway was a landing leading to the balcony. Faulkner rebuilt the servants’ quarters as a small house, using the two existing chimneys as his guide. A single-story clapboard-sided house with a hallway running down the middle, it has two rooms, a small kitchen, and a bathroom. From 1930 to 1940 the house served as a home for Caroline “Mammy Callie” Barr, a former slave who had helped to raise Faulkner and his brothers as well as his daughter, Jill. From 1940 to 1984 the house was inhabited by Faulkner’s groom, Andrew Price; his wife, Chrissy, who served as the Faulkners’ housekeeper; and later their son, John. In 1957 Faulkner added a barn to Rowan Oak and stabled his horses there. He took great pride in having constructed the building by himself. The original landscaping at Rowan Oak consisted of an alley of cedar trees and a concentric circle garden opposite the house. During the Bailey era the landscaping was allowed to expand to include the twenty-nine acres of woods attached to the back of the property. Faulkner maintained the spirit of the Bailey era by allowing self-seeded trees and wild vines to flourish. He also built a brick wall on the east side of the property and designed and maintained a small maze garden made from English tea roses and privet. The house contains much of the Faulkner family’s original furnishings, and both the house and grounds are open to visitors.